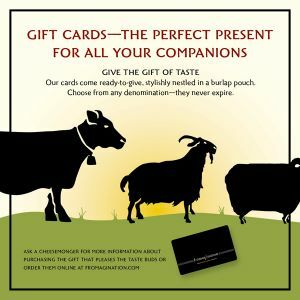 How about a Fromagination gift card? They don’t expire and you can even buy not-cheese with them…any time of year. Cards too generic? Okay, what about regular-but-varied sampling of cheese – a Cheese of the Month subscription? Not traditional enough? Okay then, one word: Stilton. We still have Colston-Bassett Stilton cheese in stock, and if they don’t like that…hmmm, how about a tie?